Creating a lesson for the first time. Go to the Lessons List under Manage then Lessons. Enter a name for the lesson the click "Create Lesson". This will being you to the Lesson Editor. Enter a name for the Module then click "Continue". For example, "Velpic Module". We can choose from a range of different Module types but let's click "Create a Velpic Module". Clicking "Create a Velpic Module" will open the Velpic Module Editor where you can create a slideshow like video with different media, transitions and timings right in your browser. Go to https://unsplash.com/ to download a nice stock image for our video. Try to choose a landscape image for a background. For example, I found this one. We can drag and drop the image directly onto the canvas or we can click the image menu item to browse for images on our machine. Enlarge the image by stretching the corners. Try and centre the image by dragging the middle of the image. Let's give the image a duration of 3 seconds. Now let's add a title by clicking the T icon to add text. I'm going to make the text colour: white, font: Tinos and size: 60. This can all be done on the right menu. In general, you want the text to contrast the background so choose white if the background is dark or black if the background is light. Double click on the text to edit the content. Position the text in the centre by dragging the middle of it. Using the right menu, select Fade as the Start Transition. Click the Play button to preview the Slide. When you're happy with the Module, click Save then Exit Editor. This will bring you back to the Lesson Editor. The Velpic Module that we just created will be converting and should be ready in a few minutes or a bit longer if the module is larger. In the meantime, let's add an assessment question. Click the "Assessment" tab. 3. To add questions after the Velpic Module, on the right of the Velpic Module, click "New Question" then "Multiple Choice Question" on the right. 4. My Question is "What city was in the background?" so I enter that into the question text field. 5. The correct answer is "New York" so I'll enter that into the first answer text field. 6. To mark the answer as correct, I'll click the cross to toggle it to a tick which indicates that this is the correct answer. 7. Click "Add New Answer". 8. Enter Beijing in the answer text field. 10. Upon saving we can choose some more advanced options like per answer feedback but we won't go into that here. You can click the "Advanced Options" link on the question to see the options. 11. We can choose the type of assessment we want by clicking the "Settings" button under the "Assessment" tab. 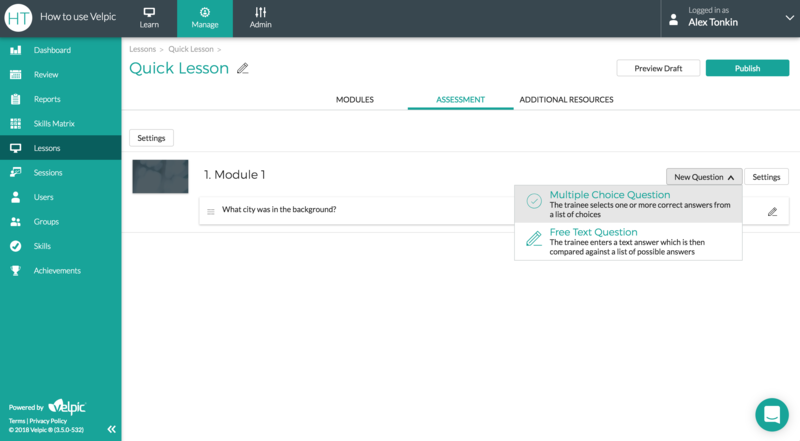 The default is a quiz where users will be given feedback on their mistakes and can't complete the lesson until all questions have been answered correctly. Once it is complete Velpic will record the number of attempts the trainee required. The other assessment type is a test where trainees will find out if they passed at the end. 12. Click the "Modules" tab to check the status of our Velpic Module conversion and we can see it has finished and we can now see a thumbnail of the module. 13. We can add additional lesson information like the name, thumbnail and description by clicking the pencil next to the lesson name. 14. We can also allow trainees to download some additional files using the "Additional Resources" tab. 15. Before publishing, we recommend previewing the lesson by clicking "Preview Draft" on the top right. We can see the Velpic Module we created followed by the question we created. 16. Click Publish so that we can begin distributing the Lesson. 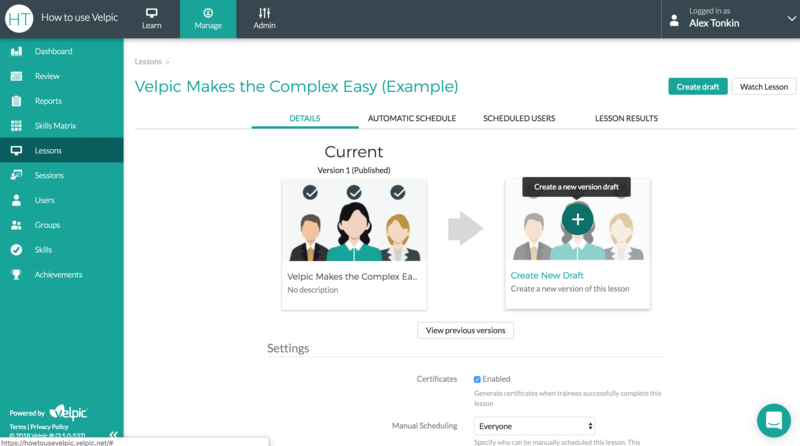 If we want to edit the lesson we can select the Create New Draft button on the Lesson Details page. If Trainees have already been scheduled the lesson then they will be moved to the latest version after, at most, 15 minutes. If there are a lot of existing schedules this might take longer. If a Trainee is has been watching the previous lesson version then they will be given 1 hour to complete the previously scheduled lesson. If a Trainee has been watching the previous lesson but not in the last hour then they will be migrated to the latest version and receive an email to notify them why their progress has been reset. We've just created our first lesson in Velpic.